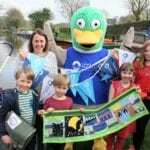 Canal & River Trust mascot Delilah the Duck, with enterprise manager Lucy Rogers, helped by Isaac (8), Benjamin (6), Ella (7) and Abby (10) at the launch of the new Marple Oldknow trails and guides. 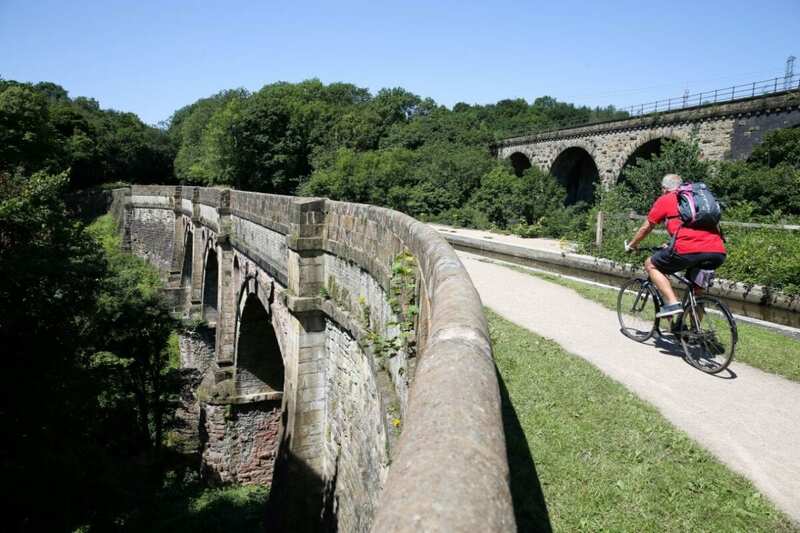 Plus Marple Aqueduct and the Peak Forest Canal – one of the three heritage sites featured in the trail. 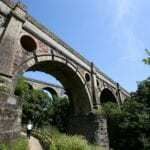 DISCOVER Marple’s fascinating industrial history with the launch of a new walking trail, family activity pack and app focusing on the legacy of Stockport industrialist and canal entrepreneur Samuel Oldknow. 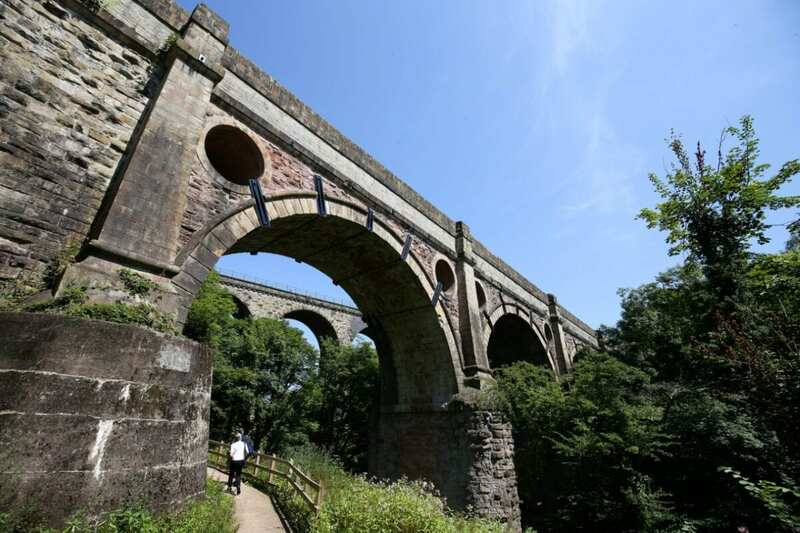 The Canal & River Trust and the Mellor Archaeological Trust have just completed a four-year £2.3 million project to ‘reveal’ three important historic landmark sites connected to Samuel Oldknow (1756 -1828) near Stockport, Greater Manchester. Marple Aqueduct, England’s highest aqueduct, has been extensively renovated to reveal stunning views along the River Goyt Valley. Mellor Mill, which burnt out in 1892, and Oldknow’s mansion have been excavated and the joint site opened up to the public, and Marple Lime Kilns have new interpretation and landscaping. A creative project with two Stockport schools, All Saints primary school in Marple and Thorn Grove primary school in Cheadle Hulme, resulted in the production of a colourful children’s storybook about Samuel Oldknow, which will soon be available in Stockport libraries. 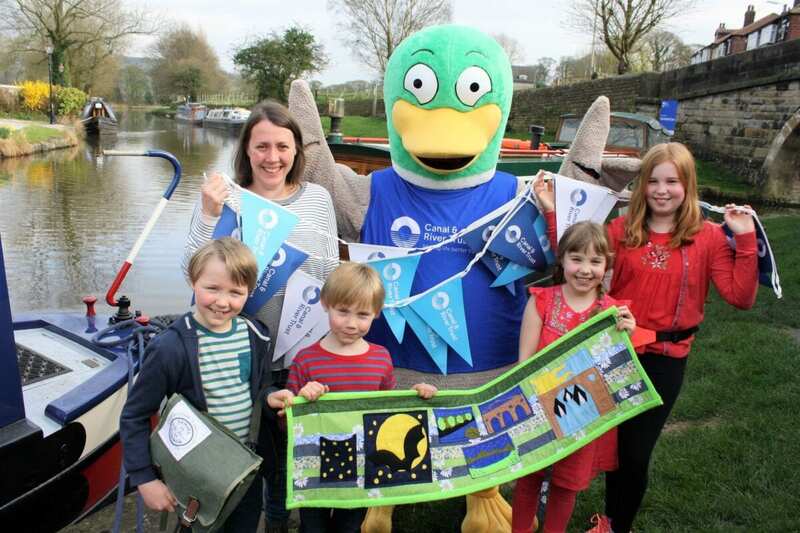 The interactive packs are suitable for children aged 2- 11 and are available to borrow, free of charge, from the Roman Lakes tearoom, near Mellor Mill. 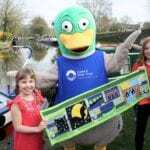 They include pre-school story challenges, bum bags containing 18 heritage and wildlife activity cards for younger school age children and for older boys and girls, activity bags focus on a fictional apprentice who lived 200 years ago. 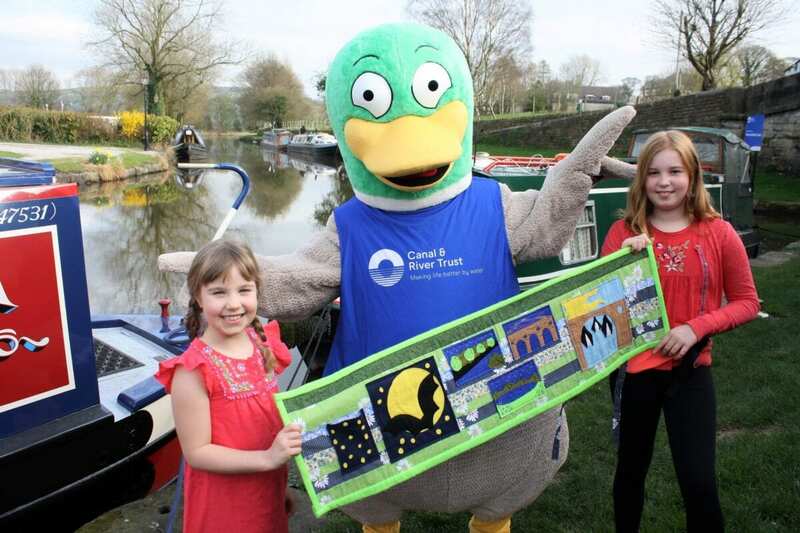 Lucy Rogers, enterprise manager with the Canal & River Trust explained: “The three sites are situated at various locations around Marple but are now united by a circular walking trail, which starts at Marple Railway Station. 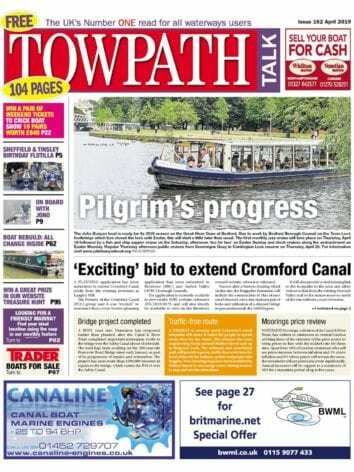 “A new map and guide marks out interesting sights as well as toilets, parking and refreshment stops. The full trail has been broken down into several smaller routes and also includes notes on disabled access. “And to complete the trio of resources – our technology revolution brings to life Samuel Oldknow’s 18th century industrial revolution with an amazing new app. Visitors simply plug in headphones and open the app as they explore the heritage sites. Revealing Oldknow’s Legacy project volunteers will be running three exciting family activity mornings during the Easter Holidays, all based in Roman Lakes tearoom. These free drop- in events will take place on Wednesdays April 10 and 17 and Friday April 26, 10am – 1pm. Previous Post:Beetles on board barge! Next Post:WIN! A Fuel Guard Water Separator and Decontaminator!